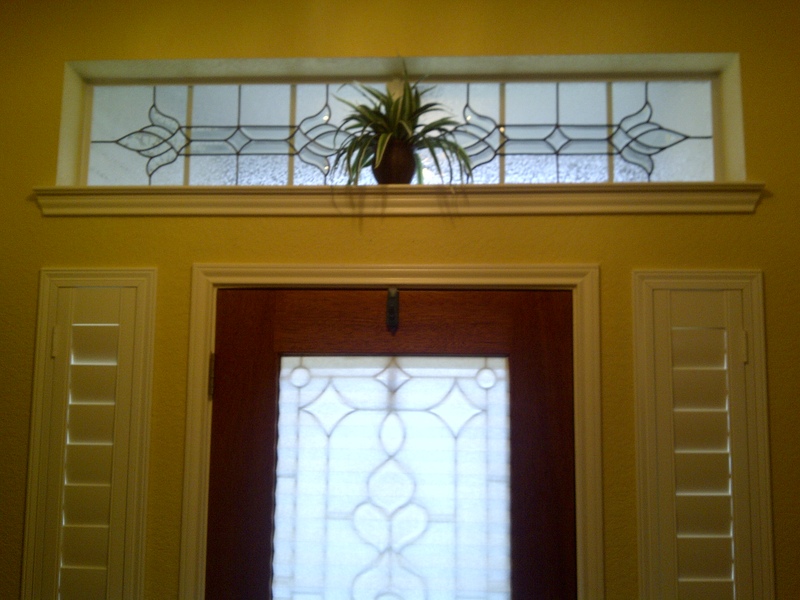 Beautiful Stained Glass Transom Window made with Bevels. Measures approximately 15.5 x 30.5. Bevel Cluster with the background of clear baroque. Can be made to any size or bevel cluster. For more information call (713) 899-0933! 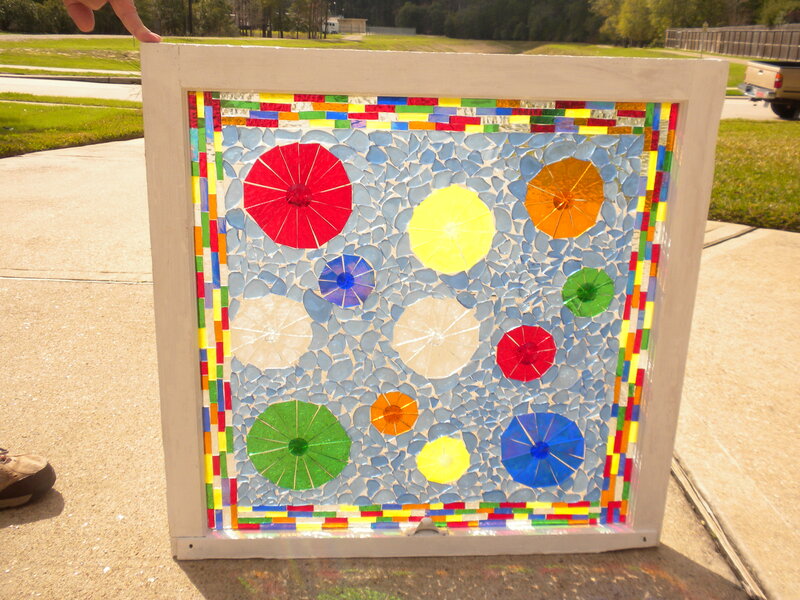 This is an old window made into art. I have attached stained glass in beautiful colors , amber, red, blue, yellow, green and clears, with faceted jewels and tumbled rock. It can be hung inside or out. The window is approximately 29-1/2″ x 30″. This piece sells for $185. Contact me at (713) 899-0933 for more information!! 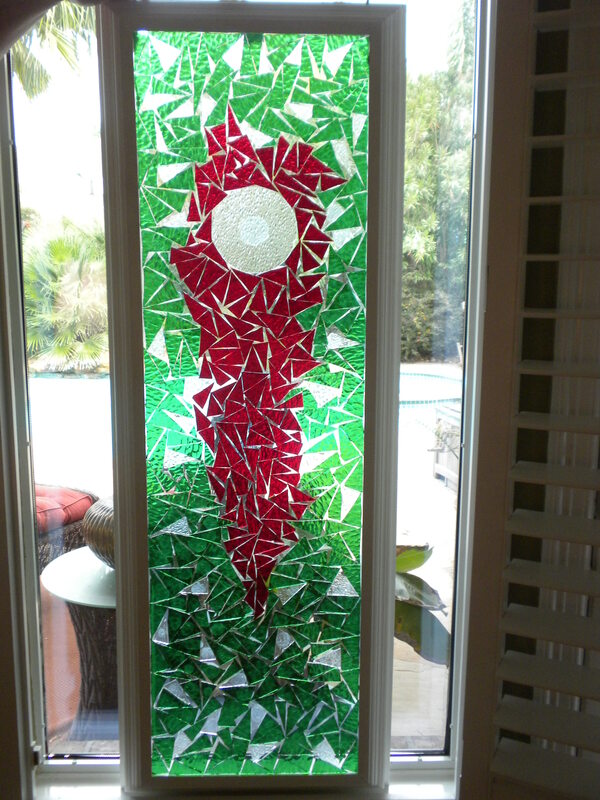 A beautiful window created with hammered red and green glass and adorned with clear crushed ice glass. Really beautiful in the sunlight. For more information please call (713) 899-0933! 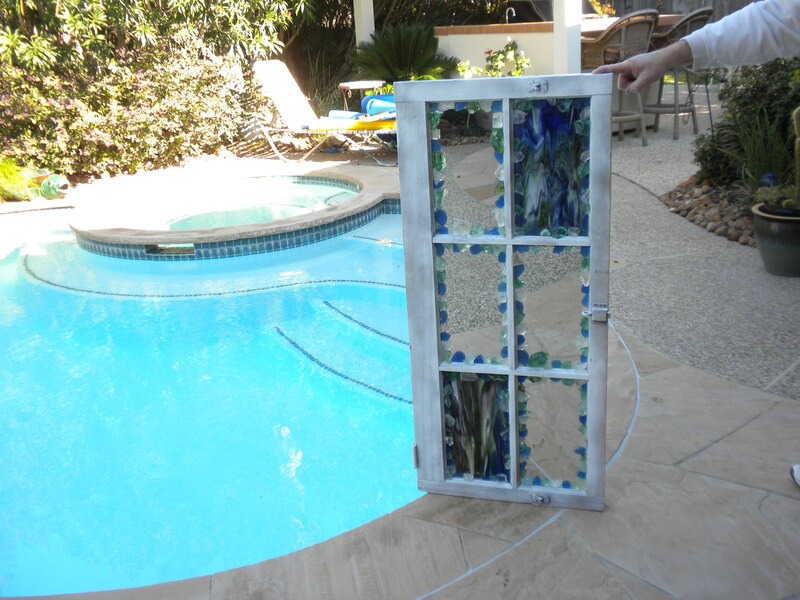 This piece is a very old window transformed into a piece of art. Has a beautiful blue blown rondel in the center surrounded with very soft colors of glass globes and crushed clear glass. Measures approximately 17″ x 28″. For more information please call (713) 899-0933. This is a window that came out of a 100 year old house that my Brother is redoing. I made this to surprise him out of the old window!!! 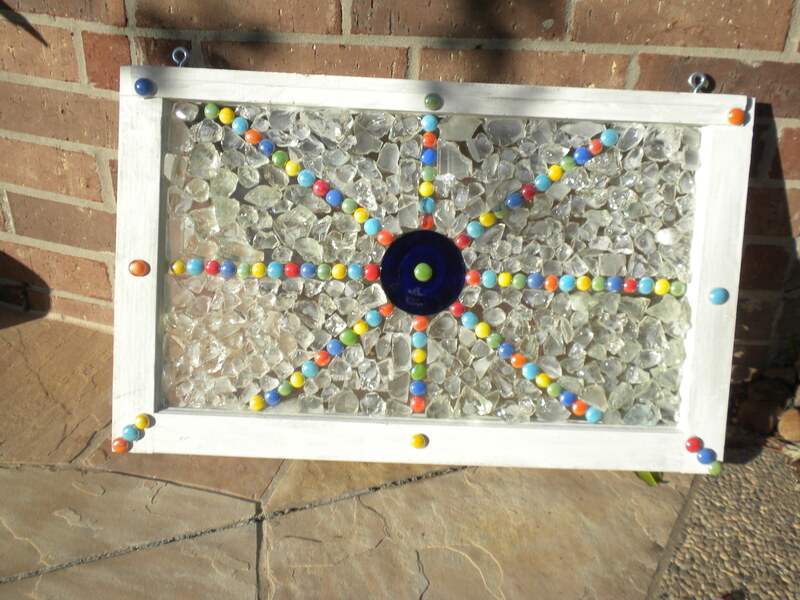 Just goes to show you can make beautiful stained glass pieces out of just about anything!!! For more information please call (713) 899-0933!!! 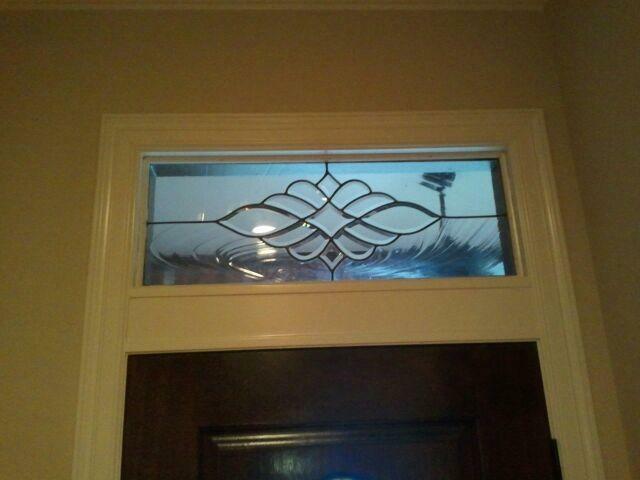 Two beautiful Bevel Stained Glass Clusters made into windows for a transom. Background is glue chip glass. For more information please call (713) 899-0933.